Glozhene monastery is located in the northern part of the Balkan Range. 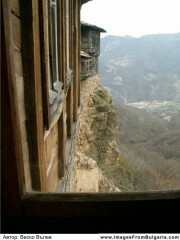 Unlike most Bulgarian monasteries, it is not hidden in the dense forests, and is built on a high and difficult to scale. The architecture is reminiscent of Mount Athos monasteries. Legend has it that the monastery was built in the 13th century by Kievan Prince George Glozh that pursued by Tartars, finds refuge in the Bulgarian lands with the permission of Tsar Ivan Asen built a monastery in the village and its vicinity. Prince wore with her miraculous icon of St. George in honor of the saint's monastery called him. Again according to prediction icon mysteriously disappeared and was later found on a cliff where in the early 17th century, the monks built a new monastery. The monastery consists of a church and concluded around buildings that form a closed courtyard. The buildings were built in 1858, probably at the old buildings. The old church was wonderfully decorated with beautiful paintings of famous painters. Unfortunately, after a major earthquake in 1913 was totally destroyed. From the old monasteries were reserved miraculous icon of St. George and a small part of the iconostasis. In 1932 a new church was built at the old, in which the iconostasis is transferred. One of the abbots of the monastery Glojen Evtimiiy Haji, a prominent folk healer, a close friend of Vasil Levski and the Secret Revolutionary Committee. The apostle is often found refuge in the sanctuary. The cell, which stayed has been converted into a museum. Another museum that is located in the monastery cell Vasil Drumev (Metropolitan Kliment). After ruling rant against Catholicism, civil court sentenced him to "eternal exile" in Glojen monastery. The monastery is a place for recreation. The windows of the cells reveals wondrous and magnificent views. There are rooms for accommodation with and without bathroom. The monastery has a restaurant offering traditional dishes.